Ghadirian, S., Vesal, N. (2013). Brachial plexus block using lidocaine/ epinephrine or lidocaine/ xylazine in fat-tailed sheep. Veterinary Research Forum, 4(3), 161-167. Safoura Ghadirian; Nasser Vesal. "Brachial plexus block using lidocaine/ epinephrine or lidocaine/ xylazine in fat-tailed sheep". Veterinary Research Forum, 4, 3, 2013, 161-167. Ghadirian, S., Vesal, N. (2013). 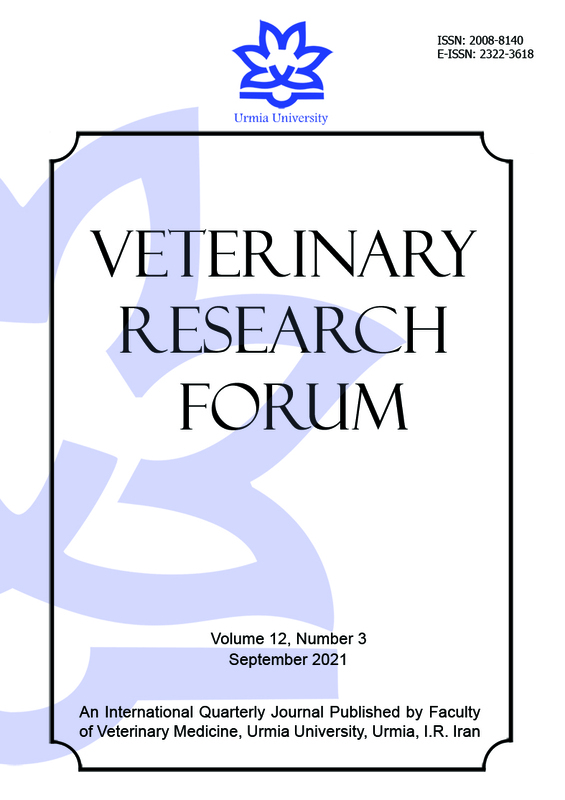 'Brachial plexus block using lidocaine/ epinephrine or lidocaine/ xylazine in fat-tailed sheep', Veterinary Research Forum, 4(3), pp. 161-167. Ghadirian, S., Vesal, N. Brachial plexus block using lidocaine/ epinephrine or lidocaine/ xylazine in fat-tailed sheep. Veterinary Research Forum, 2013; 4(3): 161-167. This blinded, randomized experimental study was designed to evaluate the analgesic effects of adding epinephrine or xylazine to lidocaine solution for brachial plexus block (BPB) in sheep. Nine healthy, fat-tailed female lambs (26.6 ± 1.5 kg) were randomly allocated into three groups: lidocaine 2%, 5 mg kg-1 (LID, n = 6), lidocaine (5 mg kg-1) with epinephrine 5 µg mL-1 (LIDEP, n = 6) or lidocaine (5 mg kg-1) with xylazine 0.05 mg kg-1 (LIDXY, n = 6). Each animal was tested twice. The sheep received a total volume of 0.25 mL kg-1 for BPB. A nerve stimulator was used to locate the nerves of the brachial plexus. Onset and duration of analgesia of the forelimb were evaluated using superficial and deep pin prick and pinching of skin with a hemostat clamp. Heart and respiratory rates, and rectal temperature were recorded before and at predetermined intervals following the completion of the block. Brachial administration of LID, LIDEP or LIDXY produced forelimb analgesia within 11.3, 11.0 and 7.0 minutes, respectively. The mean duration of analgesia was 100.0 min in LID and 133.2 min in LIDEP group. The mean duration of analgesia in LIDXY group (186.8 min) was significantly longer compared with LID group. In LIDEP group a significant increase in heart rate occurred 5 min after drug administration. Heart rate decreased from 35 to 80 minin sheep received LIDXY. In conclusion, the addition of xylazine to lidocaine solution for BBP provided a prolonged duration of action without any adverse effects in fat-tailed sheep.